This next passages are quoted from Warriors of Japan as Portrayed in the War Tales by Paul Varley. "The best example in the Heike of a Taira leader who truly exemplifies both the bun and the bu is Kiyomori's youngest brother, Tadanori. A stout warrior and reliable leader, Tadanori is called upon time and again to command forces against the Minamoto. He is, in fact, the commander of the Taira force in the western part of the fortress at Ichinotani, where Kumagae no Naozane and Hirayama no Sueshige contend to be first in battle, and is killed attempting to escape after the Taira defeat." "In the Heike version of his death, Tadanori is seen riding away from Ichinotani after the Taira defeat astride a "very big and powerful" horse and proceeding unhurriedly in the company of some one hundred warriors. A Minamoto partisan, Okabe no Tadazumi, spies Tadanori and gallops toward him, demanding that he announce his name. Tadanori tries to deceive Tadazumi by replying that he is an ally, but Tadazumi observes that Tadanori's teeth are blackened in the courtier manner and knows he is a high-ranking Taira. 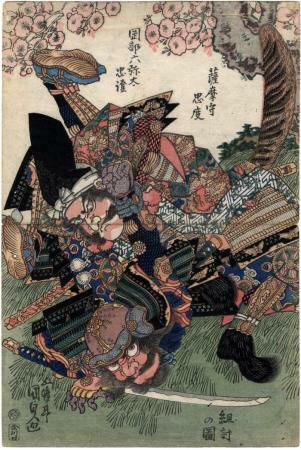 As Tadazumi closes in to grapple with Tadanori, Tadanori's hundred companions, who are temporarily assembled warriors, scatter hastily (ware saki ni) in flight. Tadanori, we are told, possesses enormous strength. After smashing Tadazumi several times with his sword, but not cleanly penetrating armor or helmet, Tadanori seizes his opponent and is about to decapitate him when one of Tadazumi's attendants rushes up and, with a deft slash of his sword, severs Tadanori's right arm. Realizing that his end has come, Tadanori quickly recites prayers to Amida Buddha, beseeching him for rebirth in the Pure Land. As he finishes, Tadazumi, from behind, lops off his head." Tadanori as a poet - This next passage is also from Varley. "Tadanori was, in reality, a distinguished poet who studied with Fujiwara no Shunzei, one of the leading masters of the age. He earned lasting fame as a poet by the inclusion of sixteen of his poems in Kin'yōshū and other imperially authorized anthologies. When the Taira, in the Heike account, leave Kyoto in 1183 in sad procession as the army of Yoshinaka bears down on the capital, Tadanori turns back to call for a last time at Shunzei's home. At first Shunzei's servants will not let him in, but he is admitted when the master himself comes to the door. Tadanori gives Shunzei a scroll with more than a hundred of his poems, imploring the master to consider them for inclusion in the anthology that, Tadanori believes, Shunzei will be commissioned by the court to compile when the country is once again at peace. Reflecting the extraordinary honor attached to the acceptance of poems for an imperially authorized anthology, Tadanori tells Shunzei that he will "feel joy in his grave and from a distance become Shunzei's guardian spirit" if even one of the poems on the scroll is selected for the anthology. Shunzei was indeed commissioned after the Gempei War to compile an anthology, the Senzaishū, which he completed in 1187, and he included in it one of Tadanori's poems. But because Tadanori was then regarded, along with all the Ise Taira, as an "enemy of the court," Shunzei wrote beneath the poem "author unknown." "